Zimbabwean President Robert Mugabe has called for elections next year to replace the country's power-sharing government. He made the announcement during a speech to the conference of his Zanu-PF party in the city of Bulawayo. The BBC's Andrew Harding at the conference says the speech was a familiar attack on foreign imperialism. 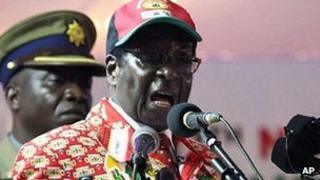 Mr Mugabe, who is 87 and reportedly in poor health, described Nato as terrorists who had destroyed Libya. President Mugabe formed a coalition in 2009 with the MDC party of Morgan Tsvangirai, now prime minister, following disputed elections. The agreement has brought greater stability to Zimbabwe but correspondents say many people believe elections could bring further turmoil. "We are saying time has come now to prepare to have elections - we just have to have elections next year," Mr Mugabe told the conference. He said the unity government had "overstayed its welcome". "Our country does not have an elected government," he said. "I am president to a political arrangement which is makeshift, undemocratic and illegitimate." Elections do not have to happen until 2013, but analysts say Mr Mugabe's supporters want them earlier for fear that the elderly president may not cope with the pressure of campaigning. He is expected to be formally endorsed as Zanu-PF's presidential candidate before the end of the conference. Mr Mugabe criticised the West, and singled out Nato's recent role in the uprising against Libyan leader Col Muammar Gaddafi. Zimbabwe's President Robert Mugabe moved to the podium with his trademark blend of languor and briskness - still looking reasonably sprightly for an 87-year-old in reportedly poor health. The crowd - perhaps 3,000-strong, seated, hot and mildly expectant after waiting for some nine hours for this moment - had just been warned not to "dare" to even talk to their neighbours during the president's speech. There had been a big build-up ahead of the keynote speech of Zanu-PF's annual party conference. And yet, there was a tangible sense that everyone in the pavilion in Bulawayo was going through the motions. "Nato - that is Europe and America - killed Libyan civilians ostensibly to protect them," he said. "Today we have a broken people, broken lives. We have to take notice and take a stance as a continental people of Africa." The alliance between Mr Mugabe and Mr Tsvangirai has been marked by frequent disagreements, however, last month they appealed for tolerance as speculation about elections next year grew. The MDC has accused Zanu-PF of disrupting its activities. The two parties are expected to draft a code of conduct to set the rules for a peaceful election. Mr Mugabe has ruled Zimbabwe since independence from Britain in 1980 and has at times resorted to ruthless measures to stay in power. He suffered his first electoral defeat in a 2000 referendum and his supporters immediately unleashed a campaign of violence against his MDC opponents. Mr Mugabe's critics say a combination of violence and fraud secured subsequent election victories. He says Western countries, led by the UK, are trying to oust him because of his policy of seizing white-owned land.